The Bollywood star kids have taken over the social media effortlessly just with their cuteness. Salman Khan‘s nephew Ahil Sharma is one of them. Mamu Salman Khan shares an endearing bond with nephew Ahil. And a recent cute picture shared by Arpita will show you how much Sallu loves kids and vice versa. Recently, it was the occasion of Aayush Sharma‘s 33rd birthday and the entire Khan and Sharma family was in attendance to make Aayush’s day even more special. 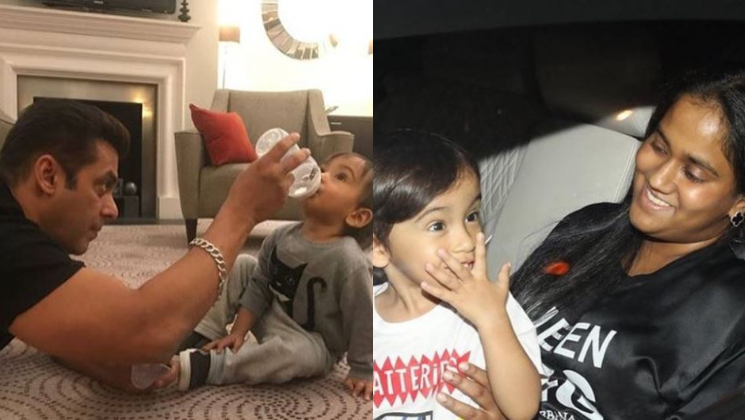 But as we see in the pictures the adorable duo, Salman Khan and Ahil Sharma steal the thunder yet again with their cuteness. While everyone was busy enjoying the bash, Salman was seen having fun with the little munchkin Ahil. Arpita Khan Sharma took to her Instagram account to share a picture from the birthday bash of hubby Aayush. She captioned the picture as, “Ahil & Mamu banter as always! Candid moments @beingsalmankhan “. It is not for the first time that Mamma, Arpita has shared the cute post of Salman Khan and Ahil’s bonding. You can check her previous posts below. Speaking about Salman Khan, the actor is currently busy shooting for his next ‘Bharat’. The film also stars Katrina Kaif, Disha Patani and Tabu in the lead roles. The Ali Abbas Zafar’s directorial is produced under the banner of T-series and Salman Khan films and slated to release on June 5, 2019.